As you probably know by now, whenever I head over to the States or Canada I make a list of everything I like the sounds of when I watch the US You Tubers. 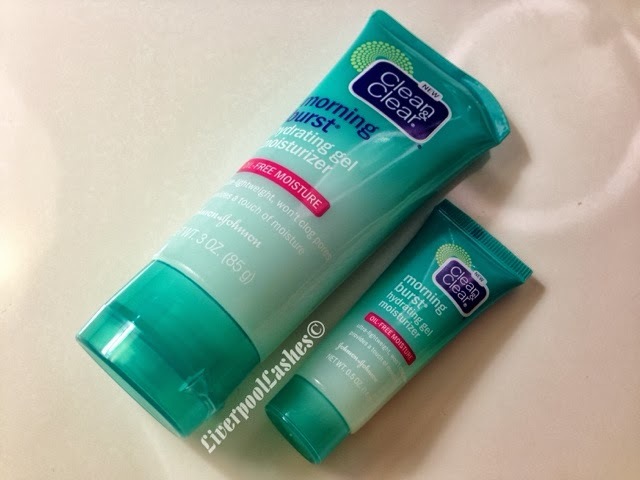 One of the products I was after was the Clean & Clear Morning Burst Hydrating Gel Moisturizer as it was mentioned on a few You Tubers channels. I triple checked that we couldn't get it in the UK as I won't waste any of my baggage allowance on anything I can get here and you couldn't! Onto the review, straight away I knew the consistency was one that I would enjoy. It's a thin, lightweight gel that sinks straight into your skin, making it absolutely idea for wearing under make up as it doesn't coat your skin like some creams do. The scent of it is fresh and awakening, when I looked at the packaging in a little more depth I found out it was meant to be cucumber. I wasn't that delighted about that as I can't stand cucumbers but thankfully I can't really detect it. After application my face is left feeling smooth and hydrated which is a rare thing, I have only found certain moisturisers that feel like they work on my skin. The bottom line is... I think this moisturiser is perfect for in the morning before make up. With regards to price it's brilliant and you get alot for your money, just as you would expect from the Clean & Clear brand. I think that if you get the chance to pick it up you should, particularly if you're like me and have oily/combination skin as it's lovely to not have a thick layer on your face. I would say however that I would definitely have a heavier duty cream for the night as I don't know how deeply it moisturises. I hope you found this review helpful! If you have any questions please let me know. The second photo shows you the smaller travel version that I got free with my bottle. I noticed this was on small bottles but not all of them.